Mesenteric cysts are rare lesions with an estimated incidence of 1:27,000. They can be either pseudocysts or epithelial cysts. The epithelial cysts can be classified as mesothelial, urachal, lymphatic, enteric, or Mullerian phenotypes. The Mullerian phenotype epithelial cysts can be of serous and mucinous subtypes. Both of which are thought to arise from Mullerian remnants in the retroperitoneum., These cysts are usually asymptomatic and usually present as a large abdominal mass. Rarely these cysts can present acutely as a result of rupture, torsion, or intestinal obstruction. We discuss a rare case of borderline mucinous cystadenoma in a 42-year-old male. A 44-years-old male patient presented with complains of distended abdomen and uneasiness. On examination, a firm mass was felt occupying the lower half of the abdomen reaching 2 cm above the umbilicus. A computed tomography showed a solid cystic lesion arising from the mesentery measuring 18 × 15 × 10 cm, adherent to the dome of the urinary bladder with fat planes present between the other abdominal organs including pancreas, stomach, and intestine [Figure 1]a and [Figure 1]b. Following an exploratory laparotomy, the mass was excised. The gross examination revealed an irregular mass with a smooth outer surface and firm consistency. The cut surface showed a multilocular cyst enclosing mucinous material [Figure 1]c. Histopathological examination showed multiple cysts of varying caliber lined by cuboidal to tall columnar epithelium having basally placed nuclei and vacuolated mucin-filled cytoplasm [Figure 1]d and [Figure 1]e. At places the epithelium showed papillary projections with nuclear stratification. The underlying stroma was composed of spindle cells with oval hyperchromatic nuclei and minimal amphophilic cytoplasmic processes, resembling ovarian stroma. No definitive evidence of invasion was seen. Immunohistochemistry showed the epithelial cells to be positive for CK7 (diffuse and cytoplasmic) and CEA (diffuse and cytoplasmic) while being negative for CK20, calretinin, and GATA3. The stromal cells were uniformly positive for ER and PR (diffuse and nuclear) [Figure 2]. A diagnosis of borderline mucinous cystadenoma of mesentery was made with an advice for close follow up. The patient was asymptomatic and free of tumor at the end of 6 months of follow-up. Mucinous cystadenomas of mesentery are rare lesions. The accepted hypothesis explaining the pathogenesis of these lesions is the possible neoplastic proliferation of the Mullerian cells which may remain along the course of the Mullerian duct., Similar to the ovarian tumor, mucinous cysts of mesentery are also graded as benign, borderline, and malignant neoplasms. 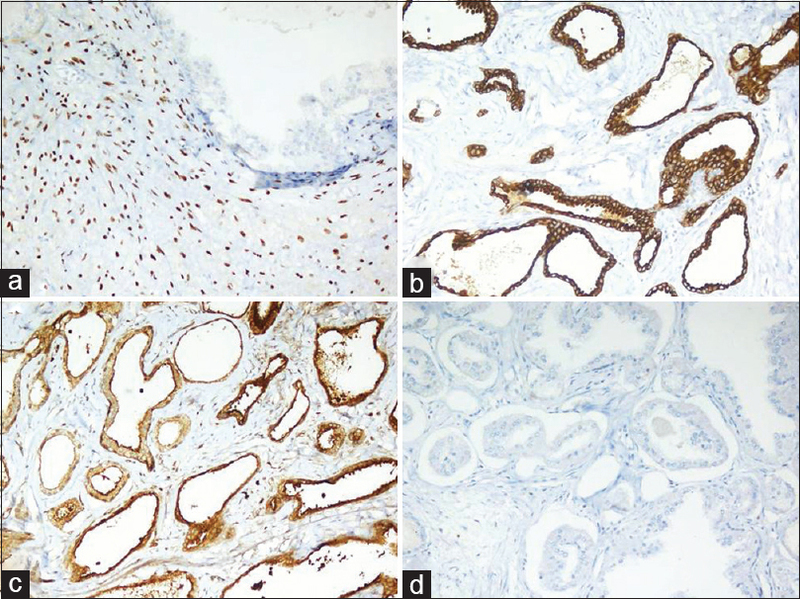 Immunohistochemistry is valuable to identify these neoplasms, with the epithelial cells having an immunophenotype of CK7 and CEA positivity and the stromal cells expressing ER and PR. The differential diagnoses include other cystic lesions of mesentery which include pseudocysts and other epithelial cysts. The pseudocysts usually have a preceding history of trauma and lack a lining epithelium. The phenotype of the epithelial cell can be ascertained by the cytomorphology of the cells and by resorting to immunohistochemistry., Pre-operative computed tomography helps to delineate the extent of the mass to help the surgeon plan appropriate resection planes., Incompletely excised and neoplasms which are borderline and beyond need a close follow up as recurrences are known. Metaxas G, Tangalos A, Pappa P, Papageorgiou I. Mucinous cystic neoplasms of the mesentery: A case report and review of the literature. World J Surg Oncol 2009;7:47. Del Gobbo A, Bimbatti M, Ferrero S. A case report of mesenteric mucinous cystoadenoma with review of the literature. BMC Gastroenterol 2010;10:105. Challa SR, Senapati D, Nulukurthi TK, Chinamilli J. Mucinous mesenteric cyst of the sigmoid mesocolon: A rare entity. BMJ Case Rep 2016;2016. pii: bcr2015210411. Banerjee R, Gough J. Cystic mucinous tumours of the mesentery and retroperitoneum: Report of three cases. Histopathology 1988;12:527-32. Dierickx I, Jacomen G, Schelfhout V, Moerman P, Corveleyn P, Spiessens T, et al. 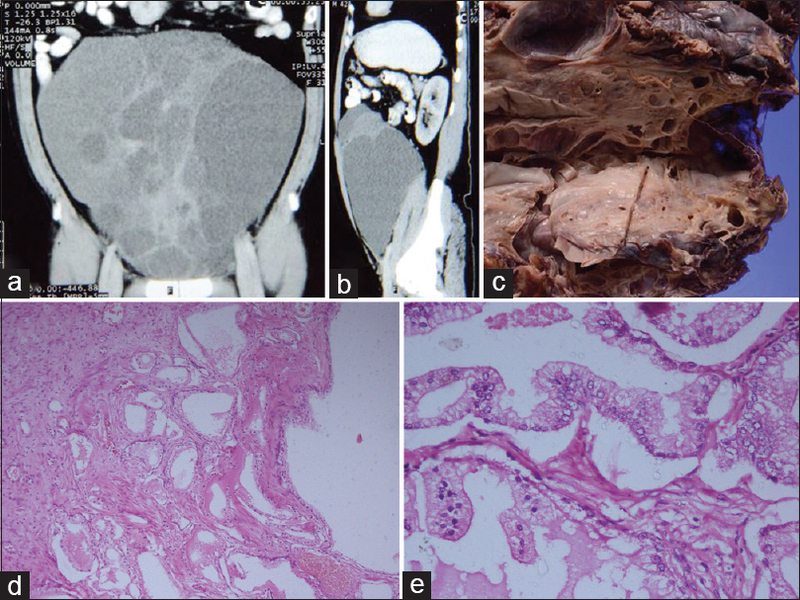 Primary retroperitoneal mucinous cystadenocarcinoma: A case report and review of the literature. Gynecol Obstet Invest 2010;70:186-91. Cauchy F, Lefevre JH, Mourra N, Parc Y, Tiret E, Balladur P, et al. Mucinous cystadenoma of the mesocolon, a rare entity frequently presenting with features of malignity: Two case reports and review of the literature. Clin Res Hepatol Gastroenterol 2012;36:e12-6.